Аннотация к книге "Aids to engineers` examinations. Prepared for applicants for all grades, with questions and answers. 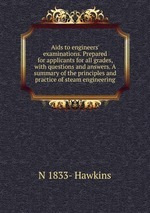 A summary of the principles and practice of steam engineering"